Hard water has a high concentration of the minerals calcium and magnesium dissolved in it. The degree of hardness becomes greater as the calcium and magnesium content increases. Hard water is not generally regarded to be a health risk, but it can be a nuisance. Mineral deposits can build up on plumbing and fixtures in the bathroom and kitchen. Hard water also makes bathing, as well as washing your clothes and dishes, more problematic—because it causes soaps and detergents to perform poorly. As we have discussed in this blog before, water is a highly effective solvent. Because of its unique chemical composition and structure, water picks up impurities easily. In fact, pure water—tasteless, colorless and odorless—is often called the universal solvent. When water combines with carbon dioxide to form very weak carbonic acid, an even better solvent is formed. Even the cleanest rainwater is slightly acidic, because some carbon dioxide gas dissolves in it as water droplets moves through the atmosphere. Then, as water moves through soil and rock formations, it dissolves very small amounts of minerals and holds them in solution. People whose groundwater supply comes in contact with large deposits of limestone or chalk have hard water. Both limestone and chalk are made up mainly from calcium carbonate. Acidic water (in the form of carbonic acid) dissolves the calcium carbonate. Sometimes water flows over gypsum rock, which contains calcium sulfate. In either case, calcium ions get into the water. A similar chemical process can also put magnesium ions in the water. These metallic ions are what cause the hardness in water. What problems are caused by hard water? More than 85% of American homes have hard water, leading to various problems throughout the house. 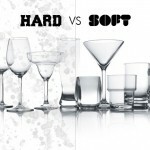 One effect of hard water is that soaps and detergents lose some effectiveness. Instead of dissolving completely, soap combines with the minerals to form a thick, gel-like soap curd. We commonly call this “soap scum.” Soap scum is sticky and insoluble. It hangs around the tub, sink and washing machine. It clings to the skin and may actually get in the way of cleansing. Washed hair and skin seems dull and lifeless. Plus, because less soap is dissolved, more is required to accomplish the job. In the laundry, things aren’t much better. Soap scum can work its way into your clothes as they’re being washed. Dirt, debris and stains can remain trapped in the fibers. Hard water can also stiffen and roughen the fabric. In addition to affecting the actual washing process, insoluble soap deposits leave spots on everything you clean—from your dishes to the family car—and a soap film will build up in your bath and shower. Yet another reason to be concerned about hard water is its negative effect on your plumbing system. Calcium and magnesium deposits can build up in pipes, reducing flow to taps and appliances. In water heaters, these minerals generate a scale buildup that reduces the efficiency and life of the heater. Although the health risks of hard water are minimal, some studies have shown a possible link between cardiovascular health and water hardness. Other research has indicated a connection between hard water usage at home and increased eczema in children. How do I treat my hard water problems? The solution to hard water is installing a water softener. In the long run, it will save you hassle, time and money. A water softener is a mechanical appliance that’s plumbed into your house’s water supply. All water softeners use the same operating principle. They trade the minerals for something else, usually sodium. The process is called ion exchange. This happens in a mineral tank filled with small polystyrene beads, also known as resin. The resin beads carry a negative charge. Calcium and magnesium in water both carry positive charges. This means that these mineral ions will cling to the beads as the hard water passes through the mineral tank. Sodium ions also have a positive charge—just not as strong as the charge on the calcium and magnesium ions. When a very strong brine solution (salt water) is flushed through a tank that has beads already saturated with calcium and magnesium, the large volume of sodium ions is enough to drive the calcium and magnesium ions off the beads. Water softeners have a separate brine tank that uses common salt (sodium chloride) to create this brine solution. In normal operation, hard water moves into the mineral tank. Then the calcium and magnesium ions move to the beads, replacing sodium ions. The sodium ions go into the water. Once the beads are saturated with calcium and magnesium, the unit enters a 3-phase regenerating cycle. First, the backwash phase reverses water flow to flush dirt out of the tank. In the recharge phase, the concentrated sodium-rich salt water solution is carried from the brine tank through the mineral tank. The sodium collects on the beads, replacing the calcium and magnesium—which go down the drain. Once this phase is over, the mineral tank is flushed of excess brine and the brine tank is refilled. Most popular water softeners have an automatic regenerating system. The most basic type has an electric timer that flushes and recharges the system on a regular schedule. During recharging, soft water is not available. A second type of control uses a computerized water meter to determine how much water is used. When enough water has passed through the mineral tank to have depleted the beads of sodium, the computer initiates regeneration. These softeners often have reserve resin capacity, so that some soft water will be available during recharging. A third type of control uses a mechanical water meter to monitor water usage and trigger recharging. Unlike the electric timer and computer metering system, no electrical components are required. Like the computerized meter, the mineral tank is only recharged when necessary. When equipped with two mineral tanks, softened water remains constantly available—even when the unit is recharging. WaterFilters.NET has a number of water softening units available for you to consider. Eliminating hard water has several advantages, from healthier hair to cleaner clothes. Now is the right time to select a water softener for your household, so you can clear away that nasty soap scum once and for all! Previous post: New on the Water Filters Blog: Testimonial Tuesdays! Next post: What is fluoride? And is it safe to have in my drinking water?